Because the name Tesla has already been registered as a trademark in China, Tesla Motors may have to operate under a different name in China. Tesla Motors may have to go by the name Tuosule in China, unless the automaker can resolve a trademark dispute. One Chinese man, Zhan Baosheng, already owned trademark rights to the name Tesla in China since 2006, and it appears that Tesla Motors is unwilling to buy the trademark at the price he is demanding. Tesla Motors see's China as a huge potential market, and needs to operate under a recognizable name in that country. The name Tuosule is a transliteration of Tesla into at least one Chinese dialect. The transliterated name was established by Tesla Hongkong, who was formed earlier than the Mainland China branch of Tesla. Both are independent companies, owned by the Tesla Motors mothership, making them sister companies. China is the worlds largest automobile market, and luxury brands already operating in that country include Audi, BMW, Mercedes-Benz, and Land Rover. Various reports claim that Baosheng is demanding US$32 million for the Tesla trademark. 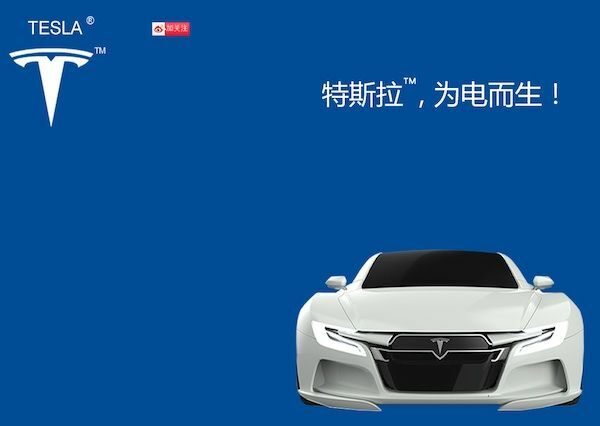 To support his claim to the Tesla trademark, Baosheng has set up a website on the tesla.cn domain (which he's owned since 2006) showing a Tesla logo and a car that resembles the Tesla Model S, that Baosheng claims he will build with the help of the state-owned Chinese carmaker Guangzhou Automobile (GAC), maker of the Trumpchi brand of electric hybrids. The International Business Times reports that Zhan Baosheng claims that the website shows a legitimate enterprise seeking investors to fund manufacturing an electric car named in honor of Nikolai Tesla, the inventor of alternating current electricity. They show images from Zhan Baosheng's trademark registrations showing a logo, and other elements, identical to the Tesla Motors logo and trademarks. China has a "first to file" system principle in its trademark law, meaning that the first person to have a trademark registration approved locally owns the rights to that trademark. That right can be challenged in court, as Tesla Motors is doing. A factor that should weigh in Tesla Motors' favor is that Zhan Baosheng has engaged in a string of trademark registrations since 2006, all targeting names of foreign companies. He also owns the domain names tesla.com.cn, teslamotors.com.cn and tesla.cn. According to China Daily, Tesla Motors has already made a deal with Qiao Weiwei who had registered a similar trademark in 2006. However, that trademark only covered "railroad vehicles, sleighs, airplanes and ships" and not "cars" which is covered by the trademark registration applied for by Zhan Baosheng. Over the years his team has produced a few car-related products, but not complete cars because they did not have the necessary license from the government. China Daily says there are two routes for Tesla to overturn Zhan Baosheng's trademark registration. The first is to prove that the name Tesla Motors is widely recognized, but at the time of Zhan Baosheng's original registration that was not the case. The other method is to prove Zhan Baosheng has not used the trademark for cars for the last three years.